I learn much every day from this great podcast. I was raised reform and have never studied Judaism in any depth. I am 54 and I love these teachings every morning. Would be great if the daily lessons would be uploaded sooner each day. Those of us on the US east coast could learn before the morning service. I download these every morning at school and listen to them throughout the day! They are a great benefit to me and I appreciate the Chabad immensely in assisting me through my conversion!!! This podcast is great, however there is just one issue: the podcast is only available in Israel later in the day; when it is just morning in America. It would be great if you can upload the shiurim a day in advance so people all over the world can download them in the morning. I make sure to download these everyday! Rabbi Bell's daily mitzvah is a great elucidation of the mitzvah. 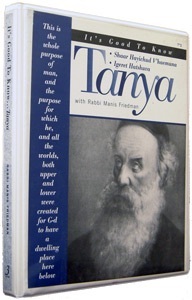 Rabbi Friedman's Tanya for the day follows Kehot's Bi-Lingual edition and adds much depth to a complex topic. The daily Rambam's audion quality is not always the best, but is a great way to study Rambam. I listen to all on my way to/from work each day. Thank you very much for putting this up, now I am able to have daily Torah study on the go! All the best. These are really great for us "on the go". Thank you so much Chabad for putting these on itunes. The Rabbi needs to use better quality devices to record the message. It is hard to understand what he is saying. Also, the Rabbi seems to be yelling at us...impart the message with passion, but with modesty. Need to know what text is referred to. The daily lessons are a wonderful help. But the Rabbi keeps referring to page numbers and there seems to be no way to find out what edition he is referring to so that I can follow along in the text. I hope this is seen so that can be added to the webpage.